Parkinson’s is a neurodegenerative condition. This means that cells in the brain are being lost over time. Any ‘cure’ for Parkinson’s is going to require some form of cell replacement therapy – introducing new cells that can replace those that were lost. Cell transplantation represents one approach to cell replacement therapy, and this week we learned that the Japanese regulatory authorities have given the green light for a new cell transplantation clinical trial to take place in Kyoto. This new trial will involve cells derived from induced pluripotent stem cells (or IPS cells). In today’s post we will discuss what induced pluripotent stem cells are, what previous research has been conducted on these cells, and what we know about the new trial. The man in the image above is Prof Shinya Yamanaka. He’s a rockstar in the biomedical research community. Prof Yamanaka is the director of Center for induced Pluripotent Stem Cell Research and Application (CiRA); and a professor at the Institute for Frontier Medical Sciences at Kyoto University. But more importantly, in 2006 he published a research report that would quite literally ‘change everything’. In that report, he demonstrated a method by which someone could take a simple skin cell (called a fibroblast), grow it in cell culture for a while, and then re-program it so that it would transform into a stem cell – a cell that is capable of becoming any kind of cell in the body. The transformed cells were called induced pluripotent stem (IPS) cell – ‘pluripotent’ meaning capable of any fate. It was an amazing feat that made the hypothetical idea of ‘personalised medicine’ suddenly very possible – take skin cells from anyone with a particular medical condition, turn them into whatever cell type you like, and then either test drugs on those cells or transplant them back into their body (replacing the cells that have been lost due to the medical condition). 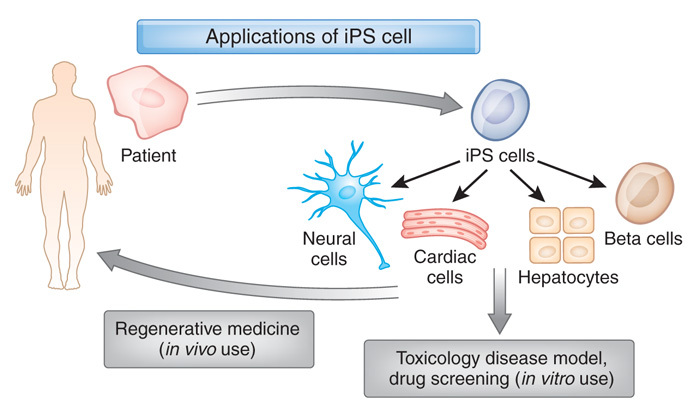 IPS cells are now being used all over the world, for all kinds of biomedical research. And many research groups are rushing to bring IPS cell-based therapies to the clinic in the hope of providing the long sort-after dream of personalised medicine. This week the Parkinson’s community received word that the Pharmaceuticals and Medical Devices Agency (PMDA) – the Japanese regulatory agency that oversees clinical trials – have agreed for researchers at Kyoto University to conduct a cell transplantation trial for Parkinson’s, using dopamine neurons derived from IPS cells. And the researchers are planning to begin their study in the next month. What exactly is an IPS cell? Are we getting NURR to the end of Parkinson’s disease? Nuclear receptor related 1 protein (or NURR1) is a protein that is critical to the development and survival of dopamine neurons – the cells in the brain that are affected in Parkinson’s disease. Given the importance of this protein for the survival of these cells, a lot of research has been conducted on finding activators of NURR1. In today’s post we will look at this research, discuss the results, and consider issues with regards to using these activators in Parkinson’s disease. Back in 1997, 10 days after Comet Hale–Bopp passed perihelion (April 1, 1997 – no joke; perihelion being the the point in the orbit of a comet when it is nearest to the sun) and just two days before golfer Tiger Woods won his first Masters Tournament, some researchers in Stockholm (Sweden) published the results of a study that would have a major impact on our understanding of how to keep dopamine neurons alive. Dopamine neurons are one group of cells in the brain that are severely affected by Parkinson’s disease. By the time a person begins to exhibit the movement symptoms of the condition, they will have lost 40-60% of the dopamine neurons in a region called the substantia nigra. In the image below, there are two sections of brain – cut on a horizontal plane through the midbrain at the level of the substantia nigra – one displaying a normal compliment of dopamine neurons and the other from a person who passed away with Parkinson’s demonstrating a reduction in this cell population. Authors: Zetterström RH, Solomin L, Jansson L, Hoffer BJ, Olson L, Perlmann T.
Journal: Science. 1997 Apr 11;276(5310):248-50. So what was this amazing gene called? This week a group of scientists have published an article which indicates differences between mice and human beings, calling into question the use of these mice in Parkinson’s disease research. The results could explain way mice do not get Parkinson’s disease, and they may also partly explain why humans do. In today’s post we will outline the new research, discuss the results, and look at whether Levodopa treatment may (or may not) be a problem. Much of our understanding of modern biology is derived from the “lower organisms”. From yeast to snails (there is a post coming shortly on a snail model of Parkinson’s disease – I kid you not) and from flies to mice, a great deal of what we know about basic biology comes from experimentation on these creatures. So much in fact that many of our current ideas about neurodegenerative diseases result from modelling those conditions in these creatures. Now say what you like about the ethics and morality of this approach, these organisms have been useful until now. And I say ‘until now’ because an interesting research report was released this week which may call into question much of the knowledge we have from the modelling of Parkinson’s disease is these creatures. You see, here’s the thing: Flies don’t naturally develop Parkinson’s disease. Nor do mice. Or snails. Or yeast for that matter. So we are forcing a very un-natural state upon the biology of these creatures and then studying the response/effect. Which could be giving us strange results that don’t necessarily apply to human beings. And this may explain our long history of failed clinical trials. What did the new research report find? The researchers who conducted this study began by growing dopamine neurons – a type of cell badly affected by Parkinson’s disease – from induced pluripotent stem (IPS) cells. What are induced pluripotent stem cells? Two months ago a research report was published in the scientific journal ‘Nature’ and it caused a bit of a fuss in the embryonic stem cell world. Embryonic stem (ES) cells are currently being pushed towards the clinic as a possible source of cells for regenerative medicine. But this new report suggested that quite a few of the embryonic stem cells being tested may be carrying genetic variations that could be bad. Bad as in cancer bad. In this post, I will review the study and discuss what it means for cell transplantation therapy for Parkinson’s disease. For folks in the stem cell field, the absolute go-to source for all things stem cell related is Prof Paul Knoepfler‘s blog “The Niche“. From the latest scientific research to exciting new stem cell biotech ventures (and even all of the regulatory changes being proposed in congress), Paul’s blog is a daily must read for anyone serious about stem cell research. He has his finger on the pulse and takes the whole field very, very seriously. For a long time now, Paul has been on a personal crusade. Like many others in the field (including yours truly), he has been expressing concern about the unsavoury practices of the growing direct-to-consumer, stem cell clinic industry. You may have seen him mentioned in the media regarding this topic (such as this article). The real concern is that while much of the field is still experimental, many stem cell clinics are making grossly unsubstantiated claims to draw in customers. From exaggerated levels of successful outcomes (100% satisfaction rate?) all the way through to talking about clinical trials that simply do not exist. The industry is badly (read: barely) regulated which is ultimately putting patients at risk (one example: three patients were left blind after undergoing an unproven stem cell treatment – click here to read more on this). While the stem cell research field fully understands and appreciates the desperate desire of the communities affected by various degenerative conditions, there has to be regulations and strict control standards that all practitioners must abide by. And first amongst any proposed standards should be that the therapy has been proven to be effective for a particular condition in independently audited double blind, placebo controlled trials. Until such proof is provided, the sellers of such products are simply preying on the desperation of the people seeking these types of procedures. Last week scientists in Sweden published research demonstrating a method by which the supportive cells of the brain (called astrocytes) can be re-programmed into dopamine neurons… in the brain of a live animal! It was a really impressive trick and it could have major implications for Parkinson’s disease. In today’s post is a long read, but in it we will review the research leading up to the study, explain the science behind the impressive feat, and discuss where things go from here. In your body at this present moment in time, there is approximately 40 trillion cells (Source). The vast majority of those cells have developed into mature types of cell and they are undertaking very specific functions. Muscle cells, heart cells, brain cells – all working together in order to keep you vertical and ticking. Now, once upon a time we believed that the maturation (or the more technical term: differentiation) of a cell was a one-way street. That is to say, once a cell became what it was destined to become, there was no going back. This was biological dogma. Then a guy in Japan did something rather amazing. Who is he and what did he do? He’s a rockstar in the scientific research community. But more importantly, in 2006 he published a research report demonstrating how someone could take a skin cell and re-program it so that was now a stem cell – capable of becoming any kind of cell in the body. Title: Induction of pluripotent stem cells from mouse embryonic and adult fibroblast cultures by defined factors. Authors: Takahashi K, Yamanaka S.
Journal: Cell. 2006 Aug 25;126(4):663-76. Shinya Yamanaka‘s team started with the hypothesis that genes which are important to the maintenance of embryonic stem cells (the cells that give rise to all cells in the body) might also be able to cause an embryonic state in mature adult cells. They selected twenty-four genes that had been previously identified as important in embryonic stem cells to test this idea. They used re-engineered retroviruses to deliver these genes to mouse skin cells. The retroviruses were emptied of all their disease causing properties, and could thus function as very efficient biological delivery systems. The skin cells were engineered so that only cells in which reactivation of the embryonic stem cells-associated gene, Fbx15, would survive the testing process. If Fbx15 was not turned on in the cells, they would die. When the researchers infected the cells with all twenty-four embryonic stem cells genes, remarkably some of the cells survived and began to divide like stem cells. In order to identify the genes necessary for the reprogramming, the researchers began removing one gene at a time from the pool of twenty-four. Through this process, they were able to narrow down the most effective genes to just four: Oct4, Sox2, cMyc, and Klf4, which became known as the Yamanaka factors. This new type of cell is called an induced pluripotent stem (IPS) cell – ‘pluripotent’ meaning capable of any fate. The discovery of IPS cells turned biological dogma on it’s head. And in acknowledgement of this amazing bit of research, in 2012 Prof Yamanaka and Prof John Gurdon (University of Cambridge) were awarded the Nobel prize for Physiology and Medicine for the discovery that mature cells can be converted back to stem cells. Prof Gurdon achieved the feat in 1962 when he removed the nucleus of a fertilised frog egg cell and replaced it with the nucleus of a cell taken from a tadpole’s intestine. The modified egg cell then grew into an adult frog! This fascinating research proved that the mature cell still contained the genetic information needed to form all types of cells. EDITOR’S NOTE: We do not want to be accused of taking anything away from Prof Gurdon’s contribution to this field (which was great!) by not mentioning his efforts here. For the sake of saving time and space, we are focusing on Prof Yamanaka’s research as it is more directly related to today’s post. This amazing discovery has opened new doors for biological research and provided us with incredible opportunities for therapeutic treatments. For example, we can now take skins cells from a person with Parkinson’s disease and turn those cells into dopamine neurons which can then be tested with various drugs to see which treatment is most effective for that particular person (personalised medicine in it’s purest form). Imagination is literally the only limiting factor with regards to the possible uses of IPS cell technology. Shortly after Yamanaka’s research was published in 2006, however, the question was asked ‘rather than going back to a primitive state, can we simply change the fate of a mature cell directly?’ For example, turn a skin cell into a neuron. This question was raised mainly to address the issue of ‘age’ in the modelling disease using IPS cells. Researchers questioned whether an aged mature cell reprogrammed into an immature IPS cell still carried the characteristics of an aged cell (and can be used to model diseases of the aged), or would we have to wait for the new cell to age before we can run experiments on it. Skin biopsies taken from aged people with neurodegenerative conditions may lose the ‘age’ element of the cell and thus an important part of the personalised medicine concept would be lost. So researchers began trying to ‘re-program’ mature cells. Taking a skin cell and turning it directly into a heart cell or a brain cell. And this is probably the craziest part of this whole post because they actually did it! Authors: Vierbuchen T, Ostermeier A, Pang ZP, Kokubu Y, Südhof TC, Wernig M.
Journal: Nature. 2010 Feb 25;463(7284):1035-41. In this study, the researchers demonstrated that the activation of three genes (Ascl1, Brn2 and Myt1l) was sufficient to rapidly and efficiently convert skin cells into functional neurons in cell culture. They called them ‘iN’ cells’ or induced neuron cells. The ‘re-programmed’ skin cells made neurons that produced many neuron-specific proteins, generated action potentials (the electrical signal that transmits a signal across a neuron), and formed functional connection (or synapses) with neighbouring cells. It was a pretty impressive achievement, which they beat one year later by converting mature liver cells into neurons – Click here to read more on this – Wow! The next step – with regards to our Parkinson’s-related interests – was to convert skin cells directly into dopamine neurons (the cells most severely affected in the condition). Title: Direct conversion of human fibroblasts to dopaminergic neurons. Journal: Proc Natl Acad Sci U S A (2011) 108:10343-10348. In this study, Swedish researchers confirmed that activation of Ascl1, Brn2, and Myt1l re-programmed human skin cells directly into functional neurons. But then if they added the activation of two additional genes, Lmx1a andFoxA2 (which are both involved in dopamine neuron generation), they could convert skin cells directly into dopamine neurons. And those dopamine neurons displayed all of the correct features of normal dopamine neurons. With the publication of this research, it suddenly seemed like anything was possible and people began make all kinds of cell types out of skin cells. For a good review on making neurons out of skin cells – Click here. Given that all of this was possible in a cell culture dish, some researchers started wondering if direct reprogramming was possible in the body. So they tried. Title: In vivo reprogramming of adult pancreatic exocrine cells to beta-cells. Authors: Zhou Q, Brown J, Kanarek A, Rajagopal J, Melton DA. Journal: Nature. 2008 Oct 2;455(7213):627-32. Using the activation of three genes (Ngn3, Pdx1 and Mafa), the investigators behind this study re-programmed differentiated pancreatic exocrine cells in adult mice into cells that closely resemble b-cells. And all of this occurred inside the animals, while the animals were wandering around & doing their thing! Now naturally, researchers in the Parkinson’s disease community began wondering if this could also be achieved in the brain, with dopamine neurons being produced from re-programmed cells. Authors: Torper O, Pfisterer U, Wolf DA, Pereira M, Lau S, Jakobsson J, Björklund A, Grealish S, Parmar M.
Journal: Proc Natl Acad Sci U S A. 2013 Apr 23;110(17):7038-43. In this study, the Swedish scientists (behind the previous direct re-programming of skin cells into dopamine neurons) wanted to determine if they could re-program cells inside the brain. Firstly, they engineered skin cells with the three genes (Ascl1, Brn2a, & Myt1l) under the control of a special chemical – only in the presence of the chemical, the genes would be activated. They next transplanted these skin cells into the brains of mice and began adding the chemical to the drinking water of the mice. At 1 & 3 months after transplantation, the investigators found re-programmed cells inside the brains of the mice. Next, the researchers improved on their recipe for producing dopamine neurons by adding the activation of two further genes: Otx2 and Lmx1b (also important in the development of dopamine neurons). So they were now activating a lot of genes: Ascl1, Brn2a, Myt1l, Lmx1a, FoxA2, Otx2 and Lmx1b. Unfortunately, when these reprogrammed cells were transplanted into the brain, few of them survived to become mature dopamine neurons. The investigators then ask themselves ‘do we really need to transplant cells? Can’t we just reprogram cells inside the brain?’ And this is exactly what they did! They injected the viruses that allow for reprogramming directly into the brains of mice. The experiment was designed so that the cargo of the viruses would only become active in the astrocyte cells, not neurons. And when the researchers looked in the brains of these mice 6 weeks later, they found numerous re-programmed neurons, indicating that direct reprogramming is possible in the intact brain. So what was so special about the research published last week about? Why the media hype? The research published last week, by another Swedish group, took this whole process one step further: Not only did they re-program astrocytes in the brain to become dopamine neurons, but they also did this on a large enough scale to correct the motor issues in a mouse model of Parkinson’s disease. Authors: di Val Cervo PR, Romanov RA, Spigolon G, Masini D, Martín-Montañez E, Toledo EM, La Manno G, Feyder M, Pifl C, Ng YH, Sánchez SP, Linnarsson S, Wernig M, Harkany T, Fisone G, Arenas E.
These researchers began this project 6 years ago with a new cocktail of genes for reprogramming cells to become dopamine neurons. They used the activation of NEUROD1, ASCL1 and LMX1A, and a microRNA miR218 (microRNAs are genes that produce RNA, but not protein – click here for more on this). These genes improved the reprogramming efficiency of human astrocytes to 16% (that is the percentage of astrocytes that were infected with the viruses and went on to became dopamine neurons). The researchers then added some chemicals to the reprogramming process that helps dopamine neurons to develop in normal conditions, and they observed an increase in the level of reprogramming to approx. 30%. And these reprogrammed cells display many of the correct properties of dopamine neurons. Next the investigators decided to try this conversion inside the brains of mice that had Parkinson’s disease modelled in them (using a neurotoxin). The delivery of the viruses into the brains of these mice resulted in reprogrammed dopamine neurons beginning to appear, and 13 weeks after the viruses were delivered, the researchers observed improvements in the Parkinson’s disease related motor symptoms of the mice. The scientists concluded that with further optimisation, this reprogramming approach may enable clinical therapies for Parkinson’s disease, by the delivery of genes rather than transplanted cells. How does this reprogramming work? As we have indicated above, the re-programming utilises re-engineered viruses. They have been emptied of their disease causing elements, allowing us to use them as very efficient biological delivery systems. Importantly, retroviruses infect dividing cells and integrate their ‘cargo’ into the host cell’s DNA. The ‘cargo’ in the case of IPS cells, is a copy of the genes that allow reprogramming (such as the Yamanaka genes), which the cell will then start to activate, resulting in the production of protein for those genes. These proteins subsequently go on to activate a variety of genes required for the maintenance of embryonic stem cells (and re-programming of mature cells). And viruses were also used for the re-programming work in the brain as well. There is the possibility that one day we will be able to do this without viruses – in 2013, researchers made IPS cells using a specific combination of chemicals (Click here to read more about this) – but at the moment, viruses are the most efficient biological targeting tool we have. Last week researchers is Sweden published research explaining how they reprogrammed some of the helper cells in the brains of Parkinsonian mice so that they turned into dopamine neurons and helped to alleviate the symptoms the mice were feeling. This result and the trail of additional results outlined above may one day be looked back upon as the starting point for a whole new way of treating disease and injury to particular organs in the body. Suddenly we have the possibility of re-programming cells in our body to under take a new functions to help combat many of the conditions we suffer. It is important to appreciate, however, that the application of this technology is still a long way from entering the clinic (a great deal of optimisation is required). But the fact that it is possible and that we can do it, raises hope of more powerful medical therapies for future generations. As the researchers themselves admit, this technology is still a long way from the clinic. Improving the efficiency of the technique (both the infection of the cells and the reprogramming) will be required as we move down this new road. In addition, we will need to evaluate the long-term consequences of removing support cells (astrocytes) from the carefully balanced system that is the brain. Future innovations, however, may allow us to re-program stronger, more disease-resistant dopamine neurons which could correct the motor symptoms of Parkinson’s disease without being affected by the disease itself (as may be the case in transplanted cells – click here to read more about this). Watch for a lot more research coming from this topic. A research paper was published in the prestigious journal Cell this week that has some people excitedly suggesting that we are one step closer to living longer. Age is the no. 1 correlate with neurodegenerative conditions like Parkinson’s disease. A better understanding of the ageing process would greatly aid us in understanding these conditions. In today’s post we will review the research paper in question and discuss what it will mean for Parkinson’s disease. The lady in this photo is basically immortal. Henrietta Lacks was an African American woman who died in October, 1951, but (it could be argued) lives in almost every research institute in the world. Henrietta died with cervical cancer, and during her treatment, she had a (unethical) biopsy conducted on her tumor which give rise to the first human immortalised cell line that is named after her: Hela cells (Henrietta Lacks). And I kid you not when I say that there are samples of Hela cells in a freezer in almost every research institute in the world. Since the 1950s, scientists have grown 20 tons (and counting) of her cells (Source). And some of our greatest advances have been made with Hela cells, for example in 1954, Jonas Salk used HeLa cells in his research to develop the polio vaccine. We humans have a strange fascination with immortality. It could be argued that it underlies our religions, and also drives us to achieve great things during our live times. During the last three decades, science has begun probing the biology of ageing with the goal of helping us to understand how and why our bodies degrade over time in the hope that it will lead to better treatments for disease that predominantly affect the elderly. Last week research groups from Spain and the Salk institute in California published the results of a study that may be considered the first tentative steps towards actually extending life and perhaps reversing the ageing process. Title: In Vivo Amelioration of Age-Associated Hallmarks by Partial Reprogramming. Authors: Ocampo A, Reddy P, Martinez-Redondo P, Platero-Luengo A, Hatanaka F, Hishida T, Li M, Lam D, Kurita M, Beyret E, Araoka T, Vazquez-Ferrer E, Donoso D, Roman JL, Xu J, Rodriguez Esteban C, Nuñez G, Nuñez Delicado E, Campistol JM, Guillen I, Guillen P, Izpisua Belmonte JC. Journal: Cell. 2016 Dec 15;167(7):1719-1733. In their study, the researchers used something called the ‘Yamanaka factors’ to try and reverse the ageing process in mice. What are the Yamanaka factors? In 2012 he and Prof John Gurdon (University of Cambridge) were awarded the Nobel prize for Physiology and Medicine for the discovery that mature cells can be converted back to stem cells. Prof Gurdon achieved this feat by transplanting a young nucleus into an old cell, while Prof Yamanaka did the same thing with the ‘Yamanaka factors’. The Yamanaka factors are a set of 4 genes (named Myc, Oct3/4, Sox2 and Klf4) that when turned on in a mature cells (like a skin cell) can force the cell to ‘de-differentiate’ back into an immature cell that is capable of becoming any kind of cell. This induced un-programmed state means that the once adult cell has changed into something similar to an embryonic stem cell. This new cell is called an induced pluripotent stem (IPS) cell – ‘pluripotent’ meaning capable of any fate. So what did the researchers in the Cell paper do with the Yamanaka factors? They genetically engineered mice that produced the Yamanaka factors in every cell in the body. They could turn on the Yamanaka factors by adding a special chemical to the drinking water of the mice for 2 out of every 7 days. By turning on the 4 genes in this manner, the researchers found that they could extend the life span of the mice by 30%. In human terms, this would increase the average age of death from the current 80 years to 105 years! Not only did they not the increase in the life span of the mice, but the researchers also found that the reprogramming of cells improved the regenerative ability of the cells in the aged mice. They even demonstrated this in human cells carrying the Yamanaka factors. The study is very artificial – the mice and the human cell lines were engineered to produce the Yamanaka factors, which does not happen in normal nature – and we won’t be seeing any clinical trial for this kind of approach anytime soon. But the results will have big implications for the field of neurodegeneration. Ok, but what has all this got to do with Parkinson’s disease? Remember that the no. 1 correlate (association) with Parkinson’s disease is age. That is to say, your risk of developing Parkinson’s disease increases with age. So this begs the question: if we had a better understanding of the ageing process (or even just a concept of what ageing is), could we beat off Parkinson’s disease? Until the research paper reviewed above was published last week, this was all just silly hypothetical stuff. Now that we can extend the lives of mice by 30%, however, do we need to start actually considering the hypothetical as possible? Science has brought us along way and provided us with many wonderful things (I would be lost without my Apple ipod). But we are now interesting a strange new world where science is going beyond normal basic biology and this may allow us to reverse what was previously un-negotiable facts. We can argue till the cows come home over the ethics of letting people live longer, but there is tremendous potential to use this technology to deal with the neurodegenerative conditions currently affecting us. This is all very speculative, but it will be interesting to see where this leads. Stay tuned.